Dub Proof - Not Enough. 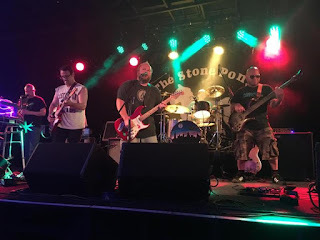 Background - Dub Proof is a groove oriented band based in Asbury Park, NJ., comprised of Nick "Turtle" Paolise (bass), Rory "Roke" Fream (guitar & lead vocals), Pat Clarke (drums), Dave "Dr. Dave" Hollander (sax & k/b), and Joe Harvard (guitar, lap steel, k/b, Kaoss /samples, b/u voc). Formed in 2007, the band has become known for it's hardworking professionalism, intriguingly original live sound and freewheeling shows. Hockey Dad - Homely Feeling. 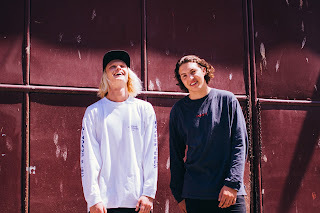 Background - Australian surf-rock duo Hockey Dad unveil the suitably raucous visuals to latest single Homely Feeling, the first taste of their sophomore album Blend Inn set for release on 9th February via Manchester Indie label LAB Records. An ode to the search for that sense of homely comfort whilst being miles away from your roots, this for Hockey Dad being the small, laid-back coastal town of Windang, Australia, Homely Feeling is a fuzzy blast of youthful energy. Now the tune is accompanied by a video that’ll make you pine for the glory days of MTV; a drained pool, inebriated-skating-grandpa antics and a whole heap of mates capture the charm and energy of youth with which Hockey Dad won hearts originally. I Hate You Just Kidding - Smokestacks. Background - Jeremy and Jessi Brock are the husband & wife songwriting duo known as I Hate You Just Kidding. They started making music together shortly after meeting and formally formed the project in 2009. 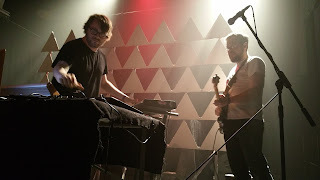 Their music has been featured in film/television and commercials, and they have gone on several national tours, leaving two EPs and one full-length album in their wake. Upon releasing their debut "Days Grow Longer" in 2011, I Hate You Just Kidding began writing a follow up. However, the touring life sometimes takes a few detours. After a 5 year hiatus, the sophomore album “Constellations” will be released on Groundhog Day, February 2nd, 2018. WEBSITE, FACEBOOK. Live: Nov 15th 2017 - The Satellite, Los Angeles, CA. 'Smokestacks' is a tuneful catchy indie song. It's starts out as uncomplicated pop that occasionally builds into a more of a rock track, either way it addictive & gorgeous. Broads - Climbs (ft. Milly Hirst). 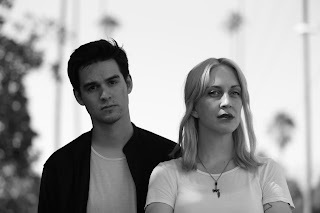 Background - British electronic duo Broads have announced that they'll be releasing their new album 'Field Theory' in the new year. 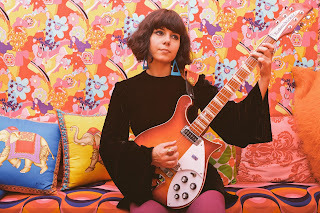 But for now, they present the first single from that 11-track album, called 'Climbs', which features mesmerizing vocals from Milly Hirst, who also co-wrote this track with band members James Ferguson and Mark Jennings. Mainstays of the Norwich music scene, Broads deliver a variety of music - always delicious - ranging from synth-pop bliss to a hybrid fusion of genres straddling the divide between ambient drone, post-rock and shoegaze. Broads takes a fascinating approach with this album, tastefully showcasing completely different sides of their musical spectrum. The Limiñanas - Shadow People (feat. Emmanuelle Seigner). 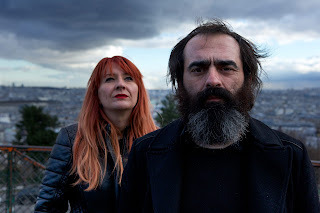 Background - French psych duo The Limiñanas have released a new track taken from their ‘Istanbul Is Sleepy’ EP out 17th November. Featuring acclaimed French accress Emmanuelle Seigner, 'Shadow People' was recorded in The Limiñanas' home studio in the South of France, and finished at The Brian Jonestown Massacre's Anton Newcombe's studio in Berlin. Lionel from the band explains: "The shadow people are an American myth, they are described as furtive apparitions, comparable to ghosts observable from the corner of the eye. These "spirits" accompany throughout your all life, a sort of paranormal glue stuck to you... Emmanuelle came to visit us in the South of France, and we asked her to sing "Shadow People" with Renaud Picard, the singer from Hair and the Iotas.